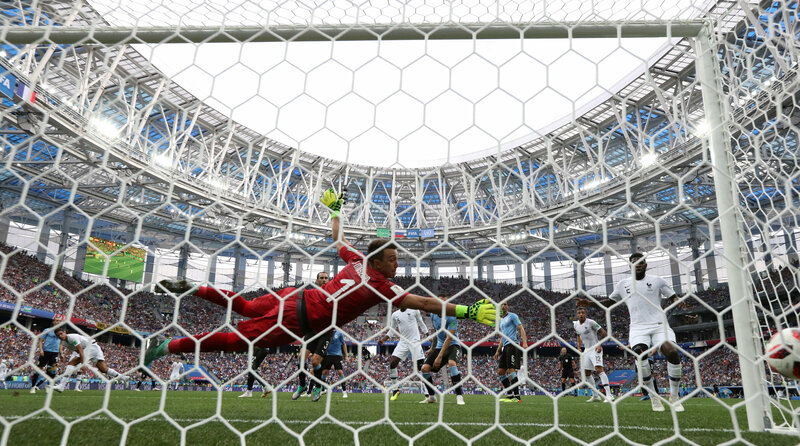 Raphael Varane's glancing header and a goalkeeping blunder that gifted Antoine Griezmann a soft goal gave France a 2-0 victory over Uruguay in the first World Cup quarter-final. Uruguay went into Friday's game without key striker Edinson Cavani, who was ruled out with a calf injury, with Cristhian Stuani drafted into the starting line-up. "I think we deserve the result," said coach Didier Deschamps, a World Cup winner with France in 1998. "We were better than they were today. We had far more mastery, especially in the second half. We didn't want to give them any opportunity. The attitude is there but we have margin for improvement," he added. In Friday's other match, Belgium struck early and held off a late Brazil fightback to send the five-times champions tumbling out of the tournament with a 2-1 victory in an end-to-end thriller. A Fernandinho own goal and a brilliant Kevin De Bruyne strike gave Belgium a spot in the last four.